The Israeli military has charged two of its soldiers with endangering the life of a Palestinian boy during Israel's offensive against Hamas in Gaza. The army said the soldiers, who had been searching a building, had instructed the nine-year-old to open bags they suspected were booby-trapped. This practice, banned by the Israeli military, is known as using someone as a human shield. Use of civilians as human shields is widely considered a war crime. The Israeli rights organisation, B'Tselem welcomed the indictments. 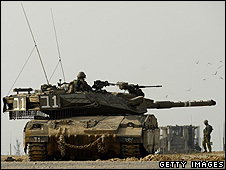 But the group repeated its call for an independent investigation of the army's operation in Gaza. The war lasted for 22 days starting on 27 December 2008. The soldiers, both staff sergeants, were charged with "engaging in unauthorised conduct in a way that endangered life and health", military sources said. The bags the Palestinian boy was forced to open turned out to be harmless. The Israeli military has opened about 150 investigations into alleged misconduct during the operation, which was named "Cast Lead". About 40 of these are criminal investigations. This is the second to lead to an indictment. In the first, a soldier was jailed for seven months for using a credit card he stole from a Palestinian in Gaza to withdraw money in Israel. Also, in January, the Israel military said it had reprimanded two top army officers for authorising an artillery attack using white phosphorus shells which hit a UN compound in Gaza last year. Critics have said it is not sufficient for the military to investigate itself. B'Tselem called again for an independent investigation into the war in a statement: "Military police investigations are not the appropriate instrument to investigate allegations regarding operation Cast Lead." "Israel must appoint an Israeli body, external to the army, to conduct an independent and effective investigation," it added. In September 2009, South African judge Richard Goldstone delivered a report to the UN Human Rights Council that concluded that war crimes had been committed by the Israeli military and Hamas, the Islamist militant group that runs Gaza. He accused Israel of deliberately targeting civilians and civilian infrastructure during the conflict. Hamas's use of indiscriminate rocket fire was judged a war crime. Israel has repeatedly accused Hamas of using Palestinian civilians as human shields by conducting military operations from densely populated areas. Human rights groups say about 1,400 Palestinians were killed in the fighting, though Israel puts the number at about 1,100. Thirteen Israeli also died during the conflict.